Letter from NYC: #502 - where were you on November 22nd in 1963? 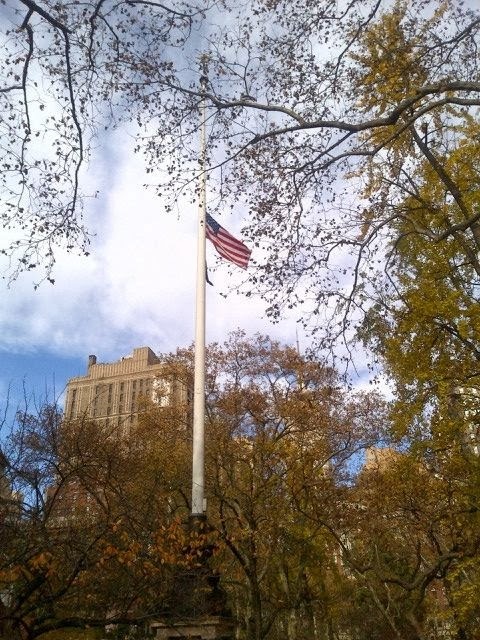 Flags in NYC (like this one in Madison Square Park) are at half mast this weekend, as they are across the country, to make the 50th anniversary of JFK's assassination yesterday. Aside from the airport, JFK had many ties to NYC and as this article from the paper yesterday indicates, NYC is claiming him as their own. "For all the images of JFK sailing off Cape Cod, lounging poolside at Palm Beach or delivering speeches in Washington or Berlin, it’s worth recalling the significant ways in which he was a New Yorker. He didn’t just live here for years; in many ways, his intellectual heart was here. In 1927, when the future president was 10 years old, his family moved to the Empire State from the Boston suburb of Brookline, Mass. After two years at 252nd Street and Independence Avenue in Riverdale, the family moved to 294 Pondfield Road in Bronxville, their home until 1942. Yes, Kennedy spent some of these years away at boarding school (Choate) and at college (Princeton, then Harvard), but New York was home. The ties to the city remained as Kennedy became a congressman, senator and president. A family office in Manhattan handled his personal expenses. He kept an apartment at the Carlyle Hotel on the Upper East Side, using it for pre-inaugural meetings and, by some accounts, assignations. His tailor, hatmaker, even his dentist were all in New York City, and he visited all three before the inauguration. As president, he celebrated his 45th birthday with an event at Madison Square Garden (where Marilyn Monroe offered her famous salute in song), and his 46th at the Waldorf-Astoria. After the assassination, his widow Jacqueline moved to Fifth Avenue and his brother Robert became senator from New York. His White House aide Arthur Schlesinger Jr., who’d been a professor at Harvard, decamped to the CUNY Graduate Center; another close aide, Ted Sorensen, also moved here as a lawyer at the firm Paul, Weiss. But the association between JFK and New York City went beyond the personal. He connected with the city as a financial capital whose economic vitality was a source of strength for an America locked in a Cold War battle with the Soviet Union. When President Kennedy wanted to make the most detailed and emphatic case for his tax cuts as a means to economic growth, he came to the Waldorf-Astoria and spoke to the New York Economic Club, where he delivered a speech still quoted on Wall Street. And he was a philo-Semite, as president OK’ing a pioneering arms sale to Israel and taking up the cause of oppressed Soviet Jewry, so Kennedy must have appreciated New York as a Jewish city. He built a close friendship with the Yiddish-speaking anticommunist labor leader David Dubinsky of the International Ladies Garment Workers Union, and in the closing days of the 1960 campaign he spoke to separate rallies of both the ILGWU and its rival, the Amalgamated Clothing Workers. The city helped to put New York state’s 45 electoral votes in Kennedy’s column, providing the winning margin in the close 1960 election. And the city’s openness to immigrants and outsiders also surely resonated with the pro-immigration Kennedy. He’d written a book titled “A Nation of Immigrants,” and while campaigning here stressed his opposition to a Nixon-backed immigration law that had favored immigrants from England at the expense of those from Italy and Eastern Europe. It was the city’s openness to newcomers and minorities that had attracted Kennedy’s father here in the first place. Joe Kennedy reportedly described WASP-dominated Boston as “no place to bring up Catholic children,” and lit out for New York by private railcar shortly after getting blackballed at the Cohasset Country Club, south of Boston. So it’s fitting that the most prominent Kennedy memorial in New York City is John F. Kennedy International Airport, where, 50 years after his death, new waves of immigrants arrive daily. Today’s newcomers are more likely to travel here by plane from Pakistan or Phnom Penh than by private railcar from Boston. But surely some of them, or their children and grandchildren, will flourish just as the Kennedys did — welcomed into a New York City that, now as then, greets migrants with unsurpassed opportunities."